Tag line: "The Roman Scandals - Bound to shock with its truth!" 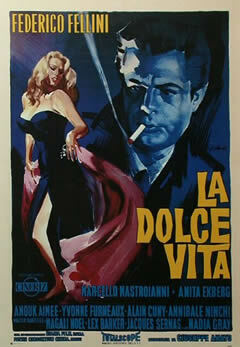 Federico Fellini’s La Dolce Vita is a film of contradictions; exposing the emptiness of a life in which pleasure is valued above all else, while at the same time celebrating the very lifestyle it seeks to condemn. Showing a flair for the visual, Fellini fills La Dolce Vita with shallowness and sophistication, corruption and culture, and in so doing demonstrates how seamlessly such extremes fold together. Though it provides him with a good living, writer Marcello Rubini (Marcello Mastroianni) laments the fact he’s nothing more than a glamorized gossip columnist. To escape his soulless existence, Marcello immerses himself in the Roman nightlife, where he meets socialites like Maddalena (Anouk Aimée), who are looking to leave their humdrum lives behind in order to have a little fun. Marcello will spend many evenings immersed in the decadence of Rome, but much to his dismay, the night offers no solution to the professional dilemma that haunts him during the day. Throughout La Dolce Vita, Marcello strives to be taken seriously as a journalist, yet is unwilling to sacrifice the social prestige that goes with his current position. At night, he leaps from excess to excess, visiting clubs and private parties in his search for good times and easy women. But the nights are inevitably separated by the days, during which Marcello reflects on the worthlessness of his life. One afternoon, he, along with dozens of other press and paparazzi, heads to the airport to greet a famous American actress (Anita Ekberg) who's just arrived in Rome. Marcello is content to remain in the background as his peers bombard her with such "timely" questions as “do you practice yoga?”, and “do you like bearded men?”. Under the light of day, Marcello can clearly see the triviality of his profession, and he despises it. Fortunately for him, the sun doesn’t stay up forever, and once its down, he's back on the streets, reveling in the debauchery that fills his empty spaces. He will, of course, find no solutions to his torments, but what he does find is something just as appealing: escape. Surrounded by others who are also searching for meaning, Marcello is, at the very least, among friends. At the heart of La Dolce Vita is the city of Rome, a city Fellini adored (he would explore it more thoroughly years later in his 1972 film, Roma). The Rome of La Dolce Vita, and most definitely the Rome that sparked Fellini’s imagination, was equal parts past and present, revealing a rich, vibrant history as it exists within a very modern society. From the regal splendor of St. Peter’s Basilica to the opulence and excitement of the Via Veneto, La Dolce Vita is a salute to a city as dual in its nature as its lead character.